The women to be honored include Oprah Winfrey, Pink, Nicole Kidman, Jane Goodall, Cate Blanchett, Tererai Trent, Janet Mock, Tracy Dyson, Cheryl Strayed, and Gabby Douglas. The installation will be located at RXR Realty’s building at 1285 Avenue of the Americas. It will open on Women’s Equality Day on August 26. 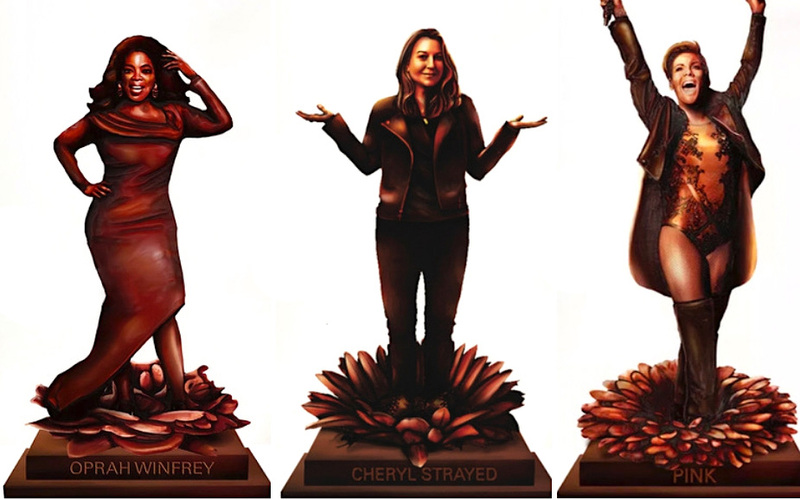 The 10 sculptures will be made of bronze because, according to the artists, the metal is “an unmistakable message that your contributions should not and will not be forgotten.” Each woman depicted in the monument will stand in the middle of an oversized flower of her own choosing, a symbol of power, comfort, and beauty. The city’s cultural affairs department, along with First Lady Chirlane McCray, launched last year an initiative, She Built NYC!, to bring more commemorations of historic NYC women to public spaces. Last November, the city announced it is commissioning a permanent statue of Shirley Chisholm, a Bed-Stuy native who became the first black woman to serve in the House of Representative. And Central Park is getting its first statue dedicated to two nonfictional women: Elizabeth Cady Stanton and Susan B. Anthony. The sculpture will be dedicated in the park on August 18, 2020, marking the 100th anniversary of the passage of the 19th Amendment. Learn more about Gillie and Marc’s “Statue of Equality” installation here.